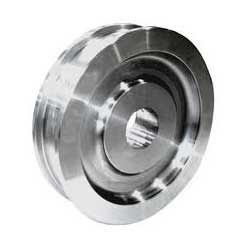 We are a leading Manufacturer of crane wheel forging from Ghaziabad, India. We manufacture a comprehensive range of Crane Wheel Forging. These Wheels are for E.O.T cranes, railways, carriage trolleys etc. These wheels are also available in a plethora of specifications. To meet the requirements of the clients, these wheels are available in different diameters and also in different sizes. Our range is sturdy, durable as well as easy to install and it requires low maintenance. These wheels provide various features like high tolerance, heavy load support. Looking for Crane Wheels Forging ?